You need patterns and templates mainly for sewing crafts, wood crafts and paper crafts. Creating permanent templates is easy and has a couple of advantages. First, if you wish to create the same project more than once you will save a lot of time because the template is already prepared. And second, if you are working with a group, the templates are durable and can be easily passed along to the next person. Permanent templates are especially useful when making crafts with children. 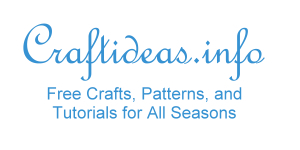 All Craft Patterns - Find craft patterns for all seasons and holidays. Copyright: Please read the information here concerning the copyright of this website.